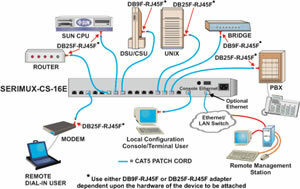 The NTI SERIMUX-CS-32 is a 32-port console serial port switch, which gives IT managers the ability to cost effectively manage serial devices, including servers, switches, routers, and telecom gear. The switch can be controlled via an ASCII terminal with menu-driven integrated software, the front panel keypad, or optional Ethernet interface. Question: Any tech support offered? We have also uploaded the manual for your convenience. Answer: Hello, I apologize. This was a slight mistake. I have confirmed with NTIs engineers, it is a 1,000ft maximum distance.